Same war time zone takes its title from a never-before shown artwork by Claire Fontaine: a détournement of Felix Gonzalez-Torres’s Perfect Lovers(1987-90): two clocks displaying the identical time of Jerusalem and Gaza, cities whose inhabitants are enemies and never meet, live through radically different consequences of the same war. Same war time zone might exhibit an apparent synchronicity; a supposedly identical condition that actually hides the totality of different experiences lived in the same geographical zone. In this war, Palestinians are left isolated, agonized, deprived of medications, clean water and hope, when Israelis enjoy a prosperous contemporary life, and the conviction to be on the right side of history. 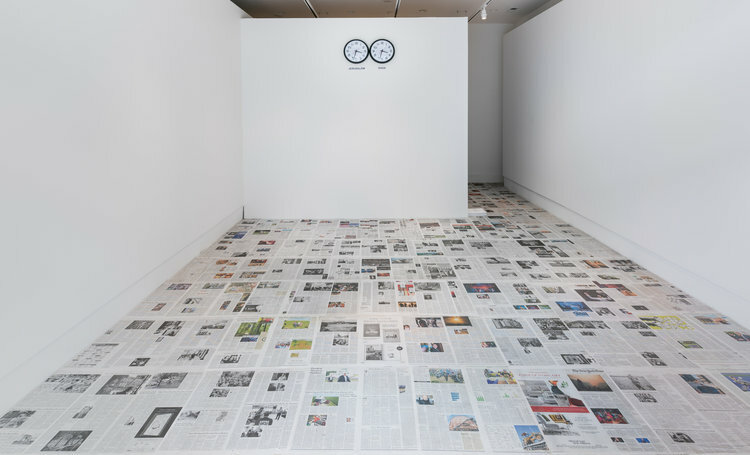 For Same war time zone Claire Fontaine has installed a Newsfloor consisting of pages obtained from bundles of The Wall Street Journal, The Oregonian, and USA Today. Claire Fontaine is feminist, conceptual artist and Paris-based collective founded in 2004. Fontaine is expropriated from the popular brand of school notebooks of the same name and has declared herself a readymade artist. Recent solo presentations include: #’displaced at Städtische Galerie (Nordhorn, DE: 2018), I Am Your Voice at Karst (Plymouth, UK: 2017), The Crack-Up at N.B.K (Berlin, DE: 2016), Claire Fontaine at Académie de France à Rome at Villa Medici (Rome, IT: 2016), Claire Fontaine at Museo Pietro Canonica (Rome, IT: 2017), MAY YOUR ENEMIES NOT PROSPER at Galerie Neu (Berlin, DE: 2016), The Winter of Discontent at Carl Kostyál (London, UK: 2015), Love Is Never Enough at Air de Paris (Paris, FR: 2015), Stop Seeking Approval at Metro Pictures (New York City, USA: 2015), Pretend To Be Dead at T293 (Rome, IT: 2015) and Using Wall, Floors and Ceilings at the Jewish Museum (New York City, USA: 2013). She has been included in a. o., Architecture Biennial (Venice, IT: 2016), CAFAM Biennial, (Beijing, CN: 2014), Thessaloniki Biennale (Thessaloniki, GR: 2013), Performa New York (New York City, USA: 2013), Shanghai Biennial (Shanghai, CN: 2012/2013); Istanbul Biennial (Istanbul, TK: 2011 and 2007); Moscow Biennial (Moscow, RUL 2011) and the Time Based SArts Festival at the Portland Institute of Contemporary Art (Portland, USA: 2011). Claire Fontaine is represented by Galerie NEU (Berlin, DE), T239 (Rome, IT), Regina Gallery (Moscow, RU) and Reena Spaulings Fine Art (New York City, USA). She is an artist in residency and a visiting faculty member of the Low-Residency MFA in Visual Studies at PNCA, in collaboration with the Institute of New Connotative Action and the Low-Residency MFA in Visual Studies at PNCA.